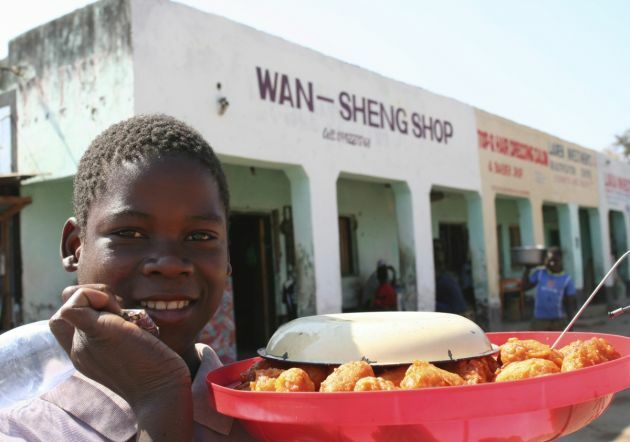 (Photo: REUTERS / Ed Cropley)A Malawian hawker sells food outside a Chinese owned shop in Salima, a dusty town of 40,000 people near the shores of Lake Malawi, August 21, 2012. Malawians bill their country as the 'Warm Heart of Africa' and have a reputation for being friendly and easy-going. But merchants in a clothes market in Salima feel less than welcoming to the Chinese traders who have moved in over the past four years. Echoing a grievance heard across the continent, traders complain of Chinese businessmen with far better access to cheap imports of clothes, shoes and electronics from home, and deeper pockets that allow them to swallow lower margins. That sentiment is part of a grass-roots reaction to Beijing's creeping diplomatic and commercial clout in Africa. Church communicators in Malawi are exploring how to use new media to build unity in the landlocked southern African nation. Malawi's bishops' communication department hosted a meeting of communications secretaries from the eight dioceses of the nation in which Scottish doctor and missionary David Livingstone once worked. It is one of the world's least developed nations. They met with Catholic journalists in a media symposium at Msamba Catholic Center in Lilongwe, Malawi's capital, between January 12 and 15. Prince Henderson, communication officer of the bishops conference, said the gathering sought to plot a path in enabling the Church "to embrace new forms of communication for evangelism." "The workshop stressed increasing the visibility of Catholic communicators and to enhance coordination of Catholic diocesan secretaries and lay Catholic journalists, among others," Henderson told CNA. In a telecast message, Bishop Martin Mtumbuka of Karonga encouraged the participants to promote the new evangelization. He urged them to maintain unity and collaboration among Catholic journalists, while promoting vigorously the Church and embracing digital communications. Father Andrew Kaufa, secretary of the bishops' social communications and organizer of the conference, solicited the members to "deliberate on how to help the Church encourage youths to embrace new forms of evangelization." Kaufa praised communicators in the African region and urged the members to find ways to make themselves visible in regional and international meetings. Father Emmanuel Chimombo, acting secretary general for the Episcopal Conference of Malawi, emphasized to the participants in his opening speech that "good communication could be a recipe for bringing people of diverse backgrounds together and growing unity." "Good communication helps us grow closer, to know one another better, and ultimately grow in unity," said Chimombo. "Media can help us greatly in this, especially now when the networks of human communication have made unprecedented advances." Chimombo noted that social media is a speedy and cheap way of exchanging information and sharing ideas, contributing to making the world a global village. However, he also advised participants to be vigilant regarding the shortcomings of social media. "Media may be used to disseminate inauthentic information, and ideas whose effects may be toxic to the Gospel and other values, such as truth telling," said Chimombo. He invited journalists to be catalysts and to proactively "act as missionary disciples who can transform the world." He suggested countering it with positive news for promoting unity in faith in the communities. The diocesan communication secretaries sharing their vision for strengthening and mobilizing Catholic communications, underlining the need for partnership and networking among media in the region. The workshop examined the challenges facing Catholic media in the region, including scarce financial and material resources and a lack of trained personnel. Fr Chrisantus Ndaga, coordinator of the Association of Member Episcopal Conferences in Eastern Africa, pointed out that bishops, priests and religious are among the most illiterate in information communication technology in the region. He recommended the "need to embrace ICT" and called its usage "a vital key to evangelisation." Ndaga said communication is needed to take play a central role in the work of the digital age so that the Church could move at the same pace as the world, saying it was the responsibility of every member of the Church to defend her teachings and values. Malawi is a nation of 16.4 million people in southern Africa, bordered by Lake Malawi, Zambia, Tanzania, and Mozambique with an a per capita GDP of less than $860 annually, substantially dependent on agriculture. Some 80 percent of the population are Christian (20 percent Catholic), and around 15 percent are Muslim.